In hindsight, have you ever wondered what would have happened if you’d taken a left instead of right, left a little earlier, or chosen the blue pill instead of the red? That’s what security guard Tempest Torres does when her hesitation to take a shot on scavengers results in a domino effect that irrevocably changes not only her life, but her world and the lives of thousands or even millions. I fell right into this dystopian novel from the first page (I have a weakness for stories involving anything genetically engineered) and the world-building with the author’s take on the ‘haves’ and ‘have-nots’ fascinated me. Excellent character development with Tempest and Alder – they’re fully-fleshed and well-rounded and the lack of romance/insta-love is a refreshing change, proving not every YA novel needs a romantic element to make an interesting read or complete a story. Although Tempest is fantastic at the physical and strategic aspects of her job, she seems a little slow in connecting the dots upon discovering certain information and for several pages I wondered how long it would take to sink in. Blight is supposedly a standalone, but I felt as if some questions were left unanswered at the end, leaving me a little puzzled. If the author chooses to continue this story, I’d definitely be interested in reading more and I’d recommend Blight to fans of YA dystopia looking for an original story. Blight is scheduled for publication August 1st, 2017. That I am, Mae – wish I had more time for my addiction! A brilliant review, Teri. I find the thought of genetic engineering really scary so I think this book will really give me the creeps. Thanks, Robbie – those genetic engineering books just worm their way into my TBR pile. Always a good read. Teri, you’ve definitely got me curious about this one. Especially when you pointed to the “what if” aspect of her choices. Thanks for another mindful review. Hugs. While I was reading this, I just couldn’t help wondering if all this would have happened to her if she’d just taken a shot on the intruder – she was probably thinking the same thing. Hugs, Teagan! 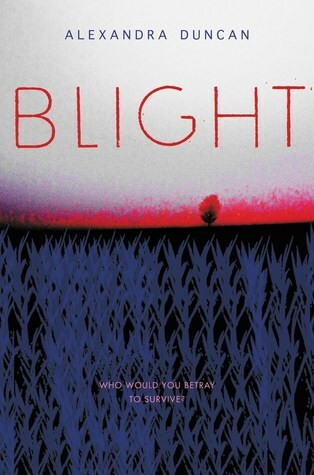 Check out the book, Blight, by Alexandra Duncan, from the Books and Such blog. Ack! Stop it! (Don’t ever stop it.) You read so quickly and most (all…all of them) are ones I would love. *sigh* Adding this one to my TBR list. Good thing I have a few months to catch up before it comes out. 😉 Really, this looks great. I love the what-if and the lack of romance. You’re right, that will be a refreshing change. I’ve only been able to read these so quickly because we had a week of vacation and a long weekend over July 4th – back to 1 per week now. If I’m lucky. And you should definitely add this one to your TBR, Sarah.